So I am not quite ready to give you my book review just yet, but for those of you interested in learning what it is I am reviewing I will tell you. I recently was selected to receive an advance copy of Courtney Joseph’s book Women Living Well, so that I could review it and share my insights from it with you. I will let you know that so far I am finding the book inspirational, in fact it is the book that inspired today’s post. 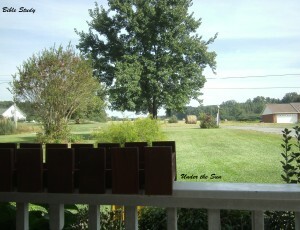 The view from my favorite spot for my quiet time with the Lord, my front porch. I want to joint together with other women and have our own bible study/ quiet time. The beauty of this bible study is that this will not occur at a set time or location, but rather when you can find 10 or so quiet minutes to yourself each day. I know each of you lead such very different lives. Some of you may work outside the home and feel as if you are busy from the moment your kids wake up to the moment you go to bed. Others of you may be a college student with a part-time job, and free time that I could only dream of for the last four years. What these differences mean is that your quiet time will look different depending on your stage in life, and your circumstances in life. For example I have finally found I am able to rise before my children and that is the best time in my day to carve out 10-20 minutes quietly with the Lord. Although some mornings the children still rise within minutes of me, on those mornings they crawl in my lap and we quietly read a chapter of the bible together and pray to start our day. Maybe your quiet time occurs in a stairwell at work over your lunch break, because that is the only quiet spot in your whole office. Or perhaps your quiet time occurs during nap time or maybe it happens after everyone else has gone to bed. Together we will have our own private Facebook group and we will email each other. It is in those forums we will ask questions of each other, hold each other accountable, learn more about one another, and dive deeper into the word with one another. So if this sort of bible study appeals to you message me on Facebook, email me, leave me a comment, or in some way, just contact me and we can get the ball rolling on developing a deeper relationship with the Lord, and with one another. This entry was posted in Life and tagged bible study, Women Living Well on September 16, 2013 by Sara R.